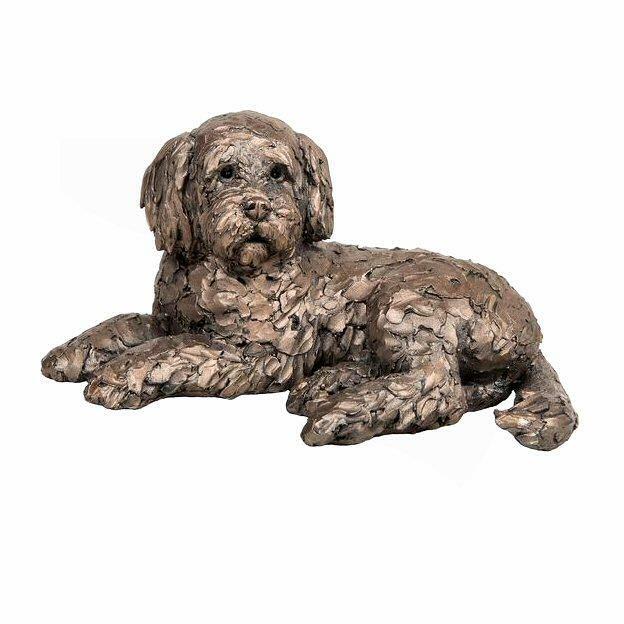 Irresistibly adorable Cockapoo in bronze from the Frith collection by acclaimed sculptor Adrian Tinsley. One of the oldest hybrid breeds, Cockapoos originated in the USA in the 1950s, a cross between a Cocker Spaniel and a Poodle, they were one breeders attempt to find a sociable family pet for allergy sufferers. The result was an irrepressibly cheerful dog that wants to be friends with everybody it meets. Energetic, happy, affectionate and loyal, Cockapoos make very popular family companions. They have a celebrity profile too, with Lady Gaga, Ashley Judd and Harry Stiles being amongst the famous names often seen out and about with their Cockapoo companions. This beautiful sculpture by Adrian Tinsley is finely crafted in hand finished, cold cast bronze would make a pefect gift for any lover of these charismatic dogs. Supplied securely boxed and packaged.